The Census Bureau recently released their yearly snapshot of how Americans are doing. Shown above, the income gap has widened since the late 1970s. According to the Census Bureau, the share of income controlled by the top 5 percent of households increased from 16.6% to 21.7%, while the share to the highest twenty percent increased from 43% to 49.4%. If you want to read more, the full report is Income, Poverty, and Health Insurance Coverage in the United States: 2005.
west indian day parade, originally uploaded by Shield. 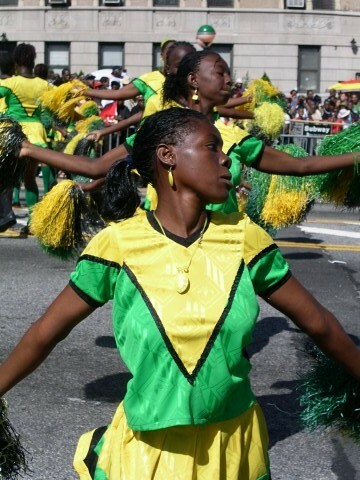 Labor Day brings Brooklyn one of the most lively and unique parades of the year - the West Indian Day Parade. There will be hundreds of floats, carnival krewes, steel drums and dance troupes parading down Eastern Parkway from Utica to Grand Army Plaza. The parkway is lined with food vendors from all over the West Indies. You can get your jerk chicken, curried goat, callaloo, coconut bread, and ginger beer, among many others. Grand Army Plaza gets incredibly congested and can be hard to maneuver. A better bet is to take the subway a few stops further and get off at Franklin or Utica. 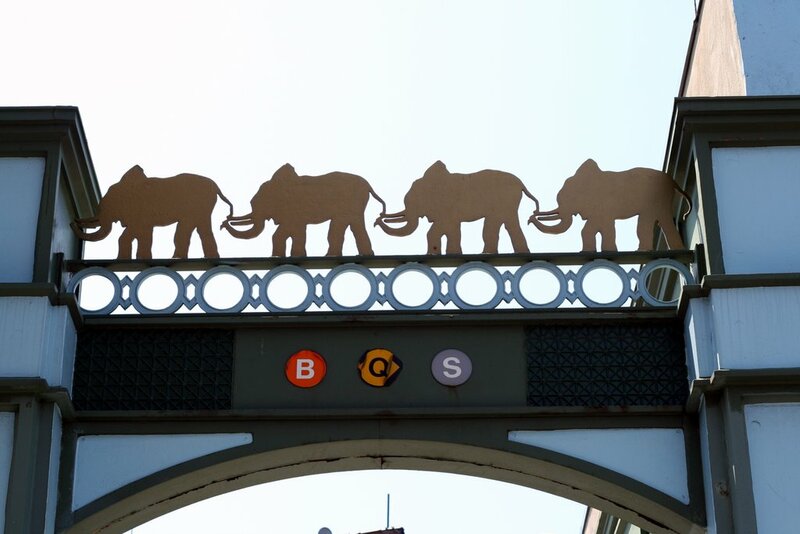 Bear in mind that the subway won't stop at the Brooklyn Museum/Eastern Parkway stop. For more info, check out Jim's Deli NY or the official parade site. All I've been able to see out my window today is rain and grey. 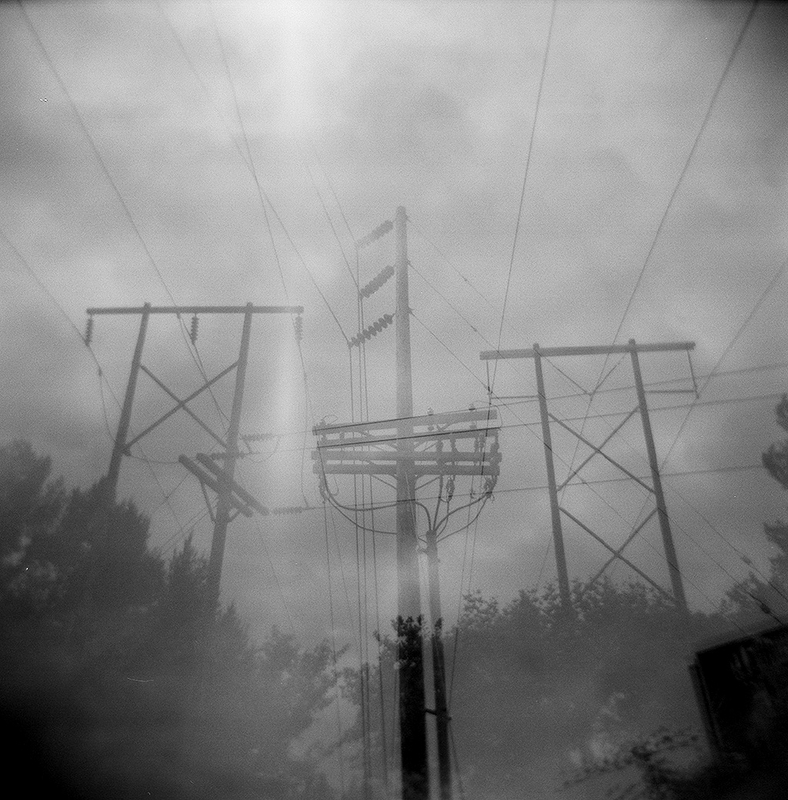 This photo by flickrite poopoorama was taken in Washington State, but it captures the Brooklyn mood well. Of course, given that today is the 1 year anniversary of Katrina, we really have no reason to complain about a little wet and grey today. Courtesy of the Brooklyn Daily Eagle comes this sweet map and discussion of the Brooklyn waterfront circa 1914. Brooklyn was a huge hub for ocean travel at the turn of the century. It was first used mostly as a port for freight, but its passenger traffic grew quickly. 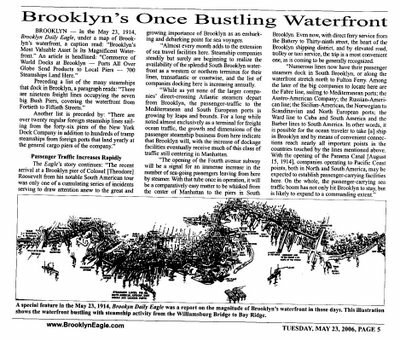 The map "shows the waterfront bustling with steamship activity from the Williamsburg Bridge to Bay Ridge." At the time of the original article, the writer looked forward with anticipation to how the building of the 4th Avenue subway would help transport passengers from ships to Manhattan. The New York Civil Liberties Union this month expanded a federal lawsuit challenging how the New York City Police Department treats photographers and filmmakers. The NYCLU alleges that NYPD officers are unlawfully detaining photographers and threatening them with arrest if they will not destroy their images or show them to police officers. Police officials allege that the most common type of complaint called into the NPYD’s terrorism hotline are reports about photographers. The NYCLU’s amended legal complaint alleges that the Department has no policies, procedures, or training for investigating such reports, and consequently, police officers are violating the First Amendment rights of photographers and filmmakers. Today's filing expands on a lawsuit that the NYCLU filed in January 2006 on behalf of Rakesh Sharma, a noted documentary filmmaker who had been detained for several hours by NYPD officers last year after filming taxi cabs from a midtown sidewalk. After filing the case, the NYCLU learned that the NYPD was conducting a large number of photography investigations and had no policies, procedures, or training for such investigations. Click to read the NYCLU’s complaint. Also serving as counsel on the case are Sam Munger and Elizabeth Owen, two NYU Law School students. archbuild, originally uploaded by alex itin. This afternoon is the big hearing on Ratner's Atlantic Yard sweetheart deal, I mean proposal. I've been studiously trying to stay away from the whole issue, leaving it to my fellow bloggers to keep on doing the thorough and thoughtful job that they've been doing. Instead, here's an Atlantic Yards-inspired painting by one of my favorite artists, Alex Itin, who is the artist-in-residence at the Institute for the Future of the Book. This painting, archbuild, which is Alex's imagining of what the skyline might look like if Ratner's project is built, can also be seen at Alex's site IT IN place. 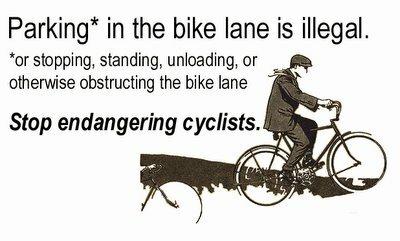 As a follow up to my previous post proposing that people take pictures of cars in bike lanes, here's a flyer I made that you can print and hand out. Click through for a sheet of six. PS- post your pics here. 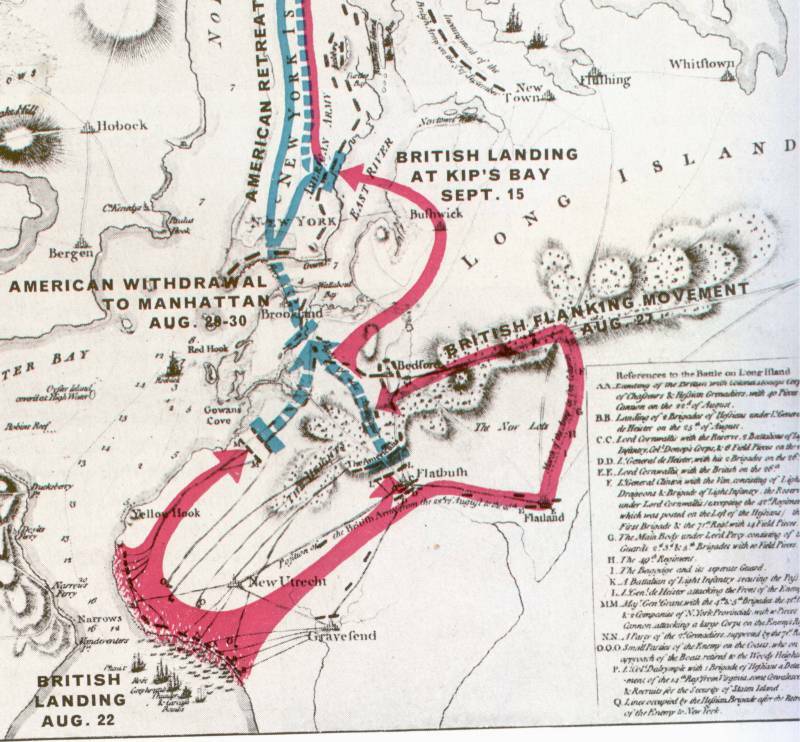 On August 22nd, 230 years ago, the infamous Battle of Brooklyn occurred. Washington’s soldiers were arrayed along the East River and camped in Red Hook and Flatbush. Rather than making a frontal assault from the water, the Brits surprised the Americans by circling to Gravesend and attacking from Jamaica with 15,000 troops (after stopping at a tavern in Bedford for drinks and directions). Over the next few days, the Americans were thoroughly defeated, although they made a valiant stand at Park Slope’s Stone House, on 3rd St and 5th Ave. With this, the British captured and held New York City for the remainder of the Revolutionary War. Newsday reports that the NYPD has decided to withdraw their proposed parade rules, but plans to submit modified plans shortly. Criticized, NYPD withdraws new definition of "parade"
"A new rule that would have banned more than 35 people from walking together on the sidewalk without a parade permit is being abandoned because of public outrage, the police department announced Friday. Proposed in July, the department's new policy on parades had been ridiculed by some as an outrageous restriction of civil rights that would have applied even to groups of schoolchildren or busloads of tourists. Spontaneous demonstrations of all but the smallest sizes would have been outlawed by the rules, critics said. Police Department spokesman Paul Browne acknowledged the criticisms Friday. He said although the department doesn't agree with many of the complaints, it had decided to make changes. A new version of the parade policy is now in the works that would eliminate any reference to sidewalk gatherings, he said. "Common sense has prevailed," said Christopher Dunn, an attorney for the New York Civil Liberties Union, which opposed the changes. "From the outset, everyone recognized that the proposed rules swept far too broadly, and we're pleased the police department has now realized that," he said. "There is simply no reason for requiring field trips, sidewalk marches and lawful bike rides to have police permits." The revision of the parade rules had been prompted by the department's running battle with participants in a monthly group bicycle ride known as Critical Mass. Once a month, scores and sometimes hundreds of cyclists gather in Manhattan for a group ride down city streets. The rides have been going on for a decade, but since the 2004 Republican National Convention the police department has been insisting that the cyclists need a parade permit. Participants have refused to apply for one, saying they shouldn't need police permission to ride their bikes, as long as they obey all traffic rules. So far, the courts have ruled for the cyclists, in part because of a lack of clarity in city regulations. Browne said the department is already planning another try at a revision. The latest proposal, he said, is expected to require any group of 10 people or more to get a parade permit if they intended to travel on a city street in a manner that does not comply with all applicable traffic laws. Any group of 20 people or more on foot, in cars or astride bikes would be required to get a permit, even if they did obey traffic rules. It was unclear Friday whether that would satisfy critics. "We would oppose any proposal that would require a police permit for people lawfully riding bikes or driving on a roadway," Dunn said." The public hearing on August 23rd has been cancelled. Follow the issue at Assemble for Rights. 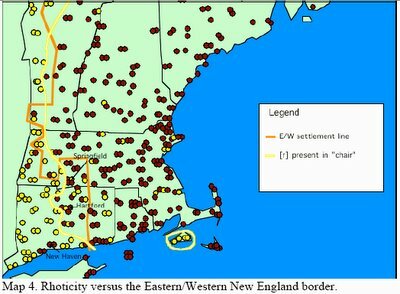 Red Sox/Yankees Boundary: Connected to Settlement & Linguistic Patterns? 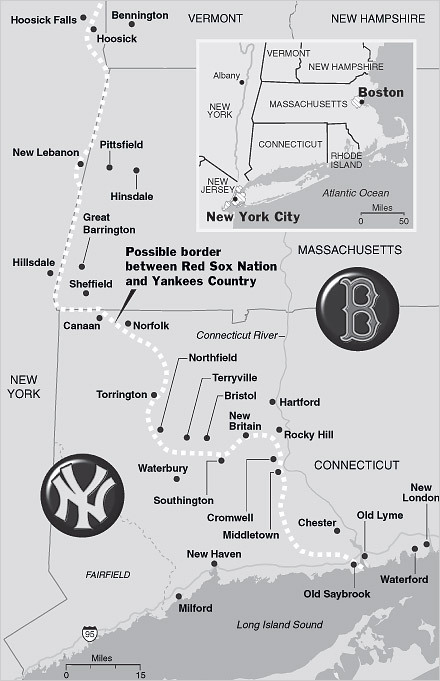 Check out this map of the dividing line between Red Sox and Yankees territory. accompanying article Where Do Rivals Draw the Line? As we would expect, the area of New England between New York and Boston is not neutral ground for baseball fans. You’ve got your fervent Yankees fans closer to New York, and your die-hard Sox believers outside of Boston. A map of the boundary demarcating Sox and Yankees territory in the New York Times this morning got me thinking. The Connecticut river marks a historic dividing line. Those east of the Connecticut river don’t pronounce the /r/ after a vowel, and pronounce the words can’t, dance, half, and bath differently. This is usually attributed to settlement patterns. Settlers from the Massachusetts Bay colony expanded southward until they hit less favorable land between the Thames and Connecticut river. Western New England, further south along the coast, was settled by English settlers who had not spend much time in the Massachusetts bay colony, and therefore had not picked up the culture or speaking patterns of Eastern New England. In the map below, the orange line shows the settlement line between Eastern and Western New England, and the yellow line shows the dividing line between those who pronounce /r/ at the end of words and those who don't. 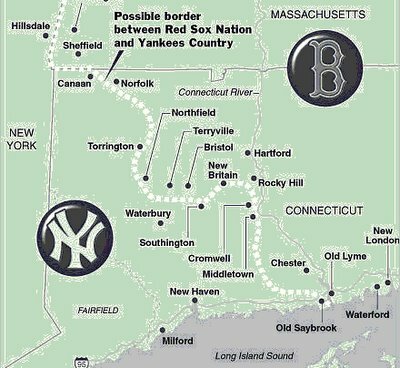 This interesting linguistic and settlement history in Connecticut produces maps that fairly track the boundary between Sox and Yankees fans. Could this be where our team loyalty comes from? Cars park in bike lanes constantly, forcing cyclists out of their lane and into traffic. Anyone who bikes knows how dangerous this is. Drivers use the bike lanes with impunity, knowing that the cops almost never do anything about it. To combat this, I started a group on flickr called Cars in Bike Lanes. Think of this as the flickr equivalent of posting john pictures in the newspaper. Your behavior doesn't look quite as pretty in the light of day, now does it? If the danger drivers pose to cyclists' lives isn't enough to convince them not to do it, perhaps public shaming will. I invite everyone - bikers, pedestrians, people with cameras - to post their own examples of cars parking in bikes lanes. 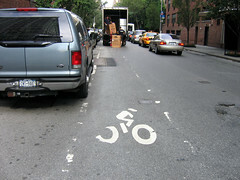 Include as much description as possible - the exact location (address or street and cross street), license plate number, date and time, and any other information - for example, your interaction with the driver, that the driver pulled over to read the paper, that the driver almost hit a cyclist pulling in or out, etc. My hope is that by posting these pictures, city officials will gain a better understanding of the scope of the problem and some of the hot spots, and we'll give drivers an incentive not to be willfully oblivious to cyclists. 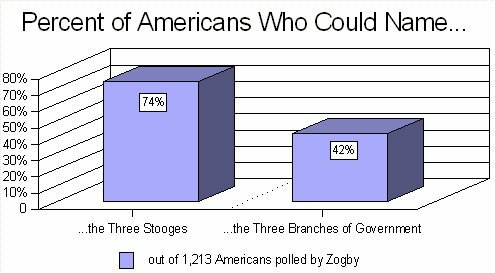 Polling firm Zogby International yesterday released a poll of 1,213 Americans comparing their pop culture knowledge to, well, slightly weightier knowledge. Guess which one won? Over three-quarters (77%) knew the names of two of Snow White's seven dwarfs, but less than a quarter (24%) knew the names of two Supreme Court justices. 57 percent knew who Harry Potter was, just slightly ahead of the 50 percent who knew who Tony Blair was. Sixty percent knew that Homer Simpson's son is named Bart. But when asked the name of one of the epic poems by the Homer of Greek mythology, only one in five could name "The Odyssey" or "The Iliad." Professor Robert Thompson, of the Bleier Centre for Television and Popular Culture, commented that "these results are not about how 'dumb' Americans are, but about how much more effectively popular culture information is communicated and retained by citizens than many of the messages that come from government, educational institutions and the media. There are important lessons to be learned here." Those of you still styied by the three branches of government question, here it is: judicial, executive and legislative. Now you can sleep easy at night. Tomorrow, August 17th, is the 7pm meeting at St. Mark's Church to address the NYPD's new definition of a "parade" that threatens to severely curtail free speech and greatly expand the NYPD's ability to detain people. "[O]ne of the more laughable (yet not very funny) expansions of the meaning of a "parade" includes at least two pedestrians or bicyclists traveling together on a public street who violate any traffic law, rule or regulation. Failure to obtain a permit before engaging in this activity --- literally speaking, whether two old folks jaywalking (particularly if wearing anti-Bush pins) or a couple of friends biking on the wrong side of the street (particularly if sporting t-shirts saying "Abolish Prisons") --- gives the police grounds to arrest." "Just as the police have used trespass laws as an easy way to stop, detain, question, search, and arrest thousands and thousands of innocent Bronx residents (in their own buildings, those of family members, while trying to visit friends, or merely standing outside), under the preposterous "parade" parameters they could stop every group of two or more people (most likely African-American and Latino men between 17 and 35) crossing the street against the light (or not) and, if the subsequent illegal search yields no contraband, arrest them nonetheless for parading without a permit." Chris Dunn, Associate Legal Director of the New York Civil Liberties Union, adds that "Requiring groups that are doing nothing more than walking on public sidewalks to obtain police permits will suppress protest activity and lead to wholly unnecessary conflict between police and protesters." If you can, go to the hearing at 1 Police Plaza on Wednesday, August 23 at 6pm where this rule will be considered. If you'd like to speak at the hearing, you have to sign up beforehand, which you can do easily here. There will be a simultaneous rally outside the hearing. You can also send e-letters to Mayor Bloomberg and City Council Speaker Christine Quinn to tell them you oppose the NYPD's change to the parade permit rules. Contact your Councilmember to tell them you oppose the NYPD's proposed rule change. My portfolio, originally uploaded by Shield. Created with fd's Flickr Toys. I've been updating my portfolio on flickr, and I'd welcome any comments or suggestions that people have. Click on the photo to see the whole set, or click on individual photo captions to see a particular photo. Row Five: 1. meatpacking district coffee, 2. flag, 3. 9/11 memorial, 4. no post no bills, 5. Gowanus barbed wire, 6. Ice cream stand. The Municipal Arts Society leads a tour exploring the northern part of Randalls Island, where there is a proposed 26-acre, $168 million water park. They promise the walk will go from East Harlem to Randalls Island, past the Art Deco Robert Moses Administration Building, and under the Triborough and Hell Gate Bridge viaducts to the northeast corner of the island for unusual views of the Bronx and the East River, from Rikers Island to the Whitestone Bridge. Tour ends in the South Bronx. Flushing Meadow Corona Park, Queens, 9 am - 6 pm, free. Picture it: 20 paddlers whose stroke cadence is led by the drummer sitting in the bow, with a decorative Chinese dragon head at the helm of the boat. Brooklyn Ramblings practiced for a while with a dragon boat team in California - it's a great spot, and well worth the trip to Flushing Meadow. The races, performance and music are also going on Sunday, 9-6. Coney Island Astroland, 4 - 10 pm, free. Party on the boardwalk to Deepa Grooves. Evidently, Deepa means brilliance in Sanskrit, and they want to show you the brilliance of rockin' out on the boardwalk on a Saturday night. Valentino Pier, 8:15 pm, free. It's Red Hook Oldtimers Day at the Red Hook summer movie series. This week they're showing Crooklyn (PG-13), with a Hook Productions short film before the feature. Joe Svehlak, urban historian at the Municipal Arts Society leads a tour of ongoing changes in "Sodom by the Sea" and "Little Odessa." 12 pm - 8 pm, Stuyvesant Cove Park (E 23rd Street and The East River), free. 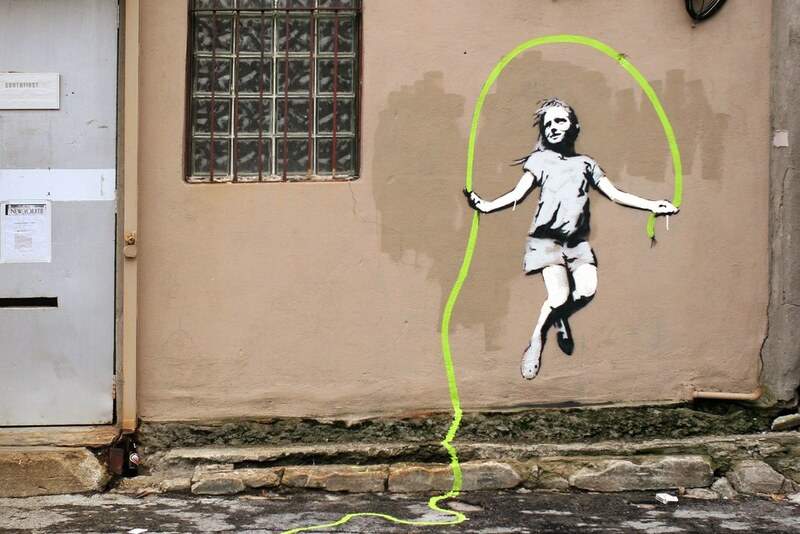 Citysol celebrates the idea that greening New York is about unleashing, not taming, the city and its energy. Each free all-day event includes: renewable energy-powered live music featuring emerging NYC acts, interactive exhibits showcasing key innovations, practices and policies for New York's sustainable future, and a green lifestyle marketplace offering apparel, electronics, household goods, media and much more." 2pm - 8pm, The Pool @ McCarren Park, (Lorimer btw Driggs and Bayard), free. Playing today in McCarren Park's emptied out pool are Deerhoof, Beirut, Apollo Sunshine, The Harlem Shakes and DJ Questlove. Music starts at 3pm. Don't forget - there's also dodgeball. But, no hot tub this week. Photo by Edwin Tse. 7:30pm, Wingate Field, Winthrop Street between Brooklyn Ave & Kingston Ave, across from Kings County Hospital (directions), free. Even if you missed LL Cool J last week, you can still catch the Caribbean music festival, with The Mighty Sparrow, Toots & The Maytals, Third World, Maxi Priest, and Rik Rok. 7:00pm, The McCarren Park Pool (Lorimer btw Driggs and Bayard), free. The L magazine screens The Swimmer, Bora Yoon and Kaki King. "We're all gonna die, Shirley. That doesn't make much sense, does it?" "Sometimes it does. Sometimes at three o'clock in the morning." 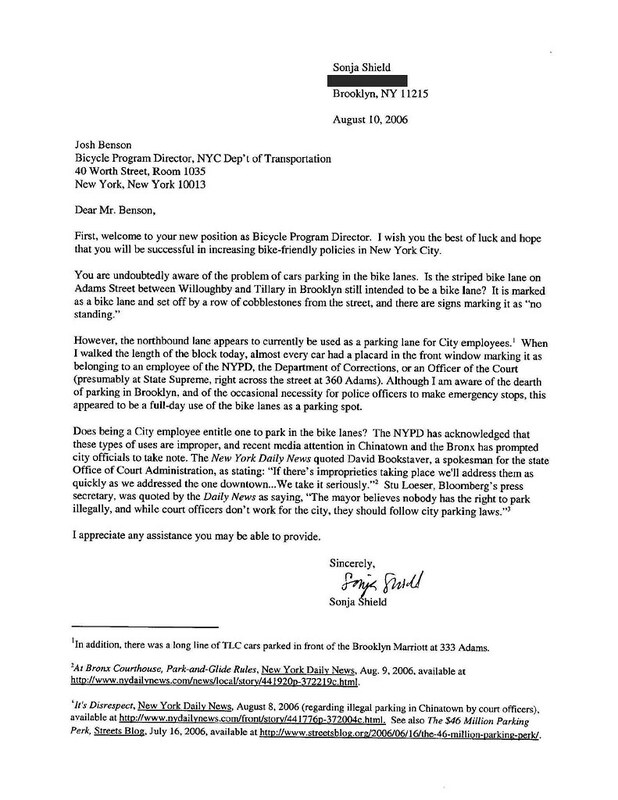 I sent this letter today to Josh Benson, the new director of the NYC Dept of Transportation's Bicycle Program. It's about the city employees who use the bike lane on Adams St in Brooklyn as an all-day parking spot. Sorry about the quality of the thumbnail - click the photo to read it more easily. Some background: Benson became the DOT's Bicycle Program director a few weeks ago, after predecessor Andrew Vesselinovitch resigned in protest against what he saw as the DOT's recalcitrance in implementing policies that would make city biking safer. "The city certainly hasn't done everything that it can do to make it safer, or to really use bicycles," the Sun quotes Vesselinovitch as saying. According to Streets Blog, Benson is himself an urban cyclist who served as the DOT Bike Program's Deputy Director in the early 2000's and more recently worked for the NYC Housing Authority. For more, see: Resident, the Daily News on DOT's Commissioner Iris Weinshall, NY Sun on Vesselinovitch's resignation, comments from Streets Blog about the need for improvements to bike lanes in New York. Biked up to Queens last night with my biking buddy Anna (hereinafter "BBA"). 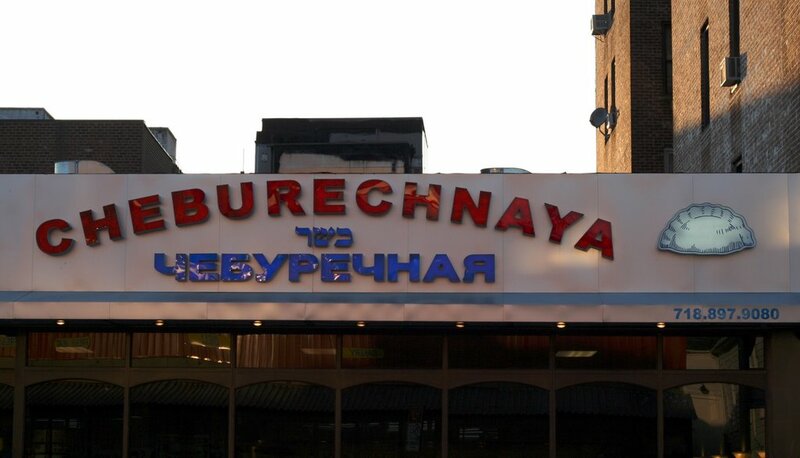 From Brooklyn, it was a cool 11 miles out to Rego Park, where we were met with juicy kebabs at Cheburechnaya. Our waitress was supremely helpful and just as amused by us. When I asked her to recommend something, she said "this is Cheburechenaya, so get the chebureki!" We followed her advice and got the chebureki, which are basically Uzbeki samosas, and lulya, lamb, and chicken kebabs. 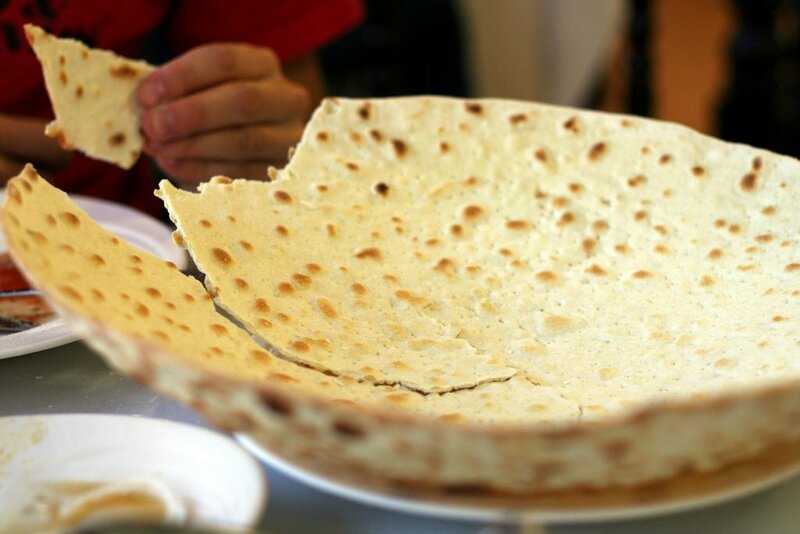 We were still hungry after that so we got babaganosh to go with the Uzbek bread (right), which looks like matzoh but is slightly less dry and tastier. Although decent, the baba was a little too mayonnaisey for our taste, so next time I'd skip the baba and stick with the more centrally Uzbek food. Then we biked up to Corona to hit the Lemon Ice King of Corona. Man, Corona is like some quaint little village that was just dropped into the middle of New York. OK, I know that a lot of Queens is like this. But still. You gotta go check it out. As for the ice, I was thrilled with the raspberry but BBA was underwhelmed with the mint chip. My guess is that, per their name, the fruit flavors are the way to go. Across from the Lemon Ice King is Corona's main park, a small village square with overhanging trees and benches and - most importantly - a very serious bocce court. At 9pm on a Wednesday night, the benches were lined with people feverishly debating bocce calls. After that, we were pretty food-dazed so we picked up some Ukranian beer in Forest Hills for the subway ride and hit the F train. Grand total: 11 miles, $10 (chebureki, 2 kebabs, bread, baba), $1.25 ice, $1.39 beer. Bocce game: priceless. 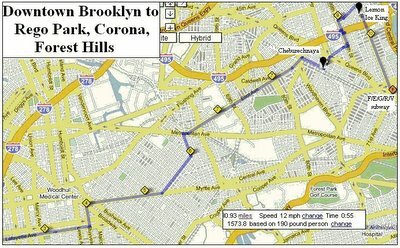 About the ride itself - it was really fast getting up to Queens, definitely faster than taking the subway. Myrtle was a little hairy, but aside from that the rest of the route was pretty smooth. 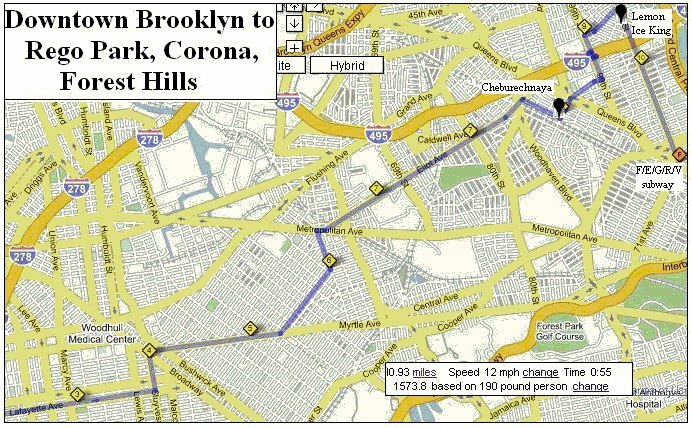 The route basically goes Fort Greene -- Bed-Stuy -- Bushwick -- Ridgewood (historically claimed by both Brooklyn and Queens) -- Middle Village -- Rego Park -- Corona -- Forest Hills. Click the map to see it larger, or go to WalkJogRun for the entire cue sheet for the ride. This firehouse out on Flatbush and East 48th Street, serving the Flatlands neighborhood, bills itself as the Friendly Firehouse. You can see a 1997 photo here from before the smiley face was painted on the door, along with a lot of tough trucks. And here's a smiley face flag they've got hanging inside (photo by firefighter Vincent Sammarco). Appearing at a news conference at a firehouse in Brownsville, Mayor Bloomberg yesterday announced plans to change FDNY entrance requirements in an effort to diversity a fire department that is overwhelmingly white and male. The department will lower the number of college credits required from 30 to 15. Applicants with military service, or who have held a paid, full-time job for six months, will not be required to have any college credits. The department also plans to embark on a broad, multilingual publicity campaign to get the word out, and increase training for probationary firefighters. Capt. Paul Washington, president of a group of black firefighters, expressed concern that these steps, while welcome, might not be sufficient. "Those that take the test tend to get on the list in equal numbers, but the problem is that blacks tend to be at the bottom of the list and don't get reached as well as their white counterparts," he said. The Department of Justice has an ongoing investigation into possible hiring discrimination in the FDNY. The next FDNY test in January 2007 will guide hiring for the next four years. More: Newsday, New York Daily News article and editorial, Staten Island Advance. A hot summer afternoon caught at DeSalvio Playground on Spring & Mulberry. 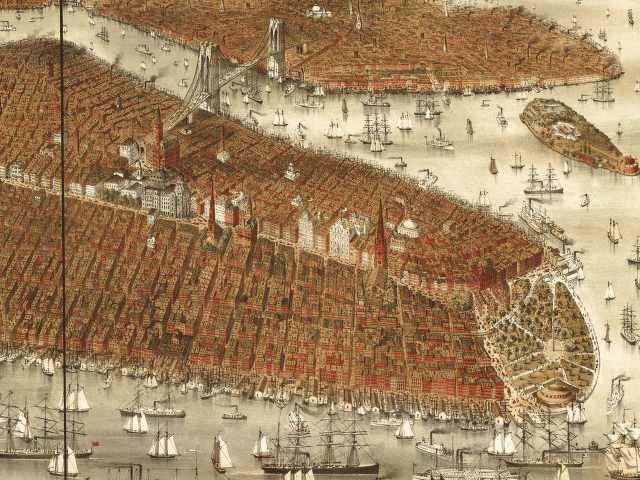 From the Library of Congress comes this map of New York and Brooklyn with the Jersey City and Hoboken water front, published in 1877 by Currier & Ives. You can see the Brooklyn Bridge, but the other bridges to Brooklyn have yet to be built. Some of the landmarks, from left to right: City Hall, Post Office, St. Paul's Church, Brooklyn Bridge, Trinity Church, Custom House, Bowling Green, South Ferry, Battery, Castle Garden, Staten Island Ferry. 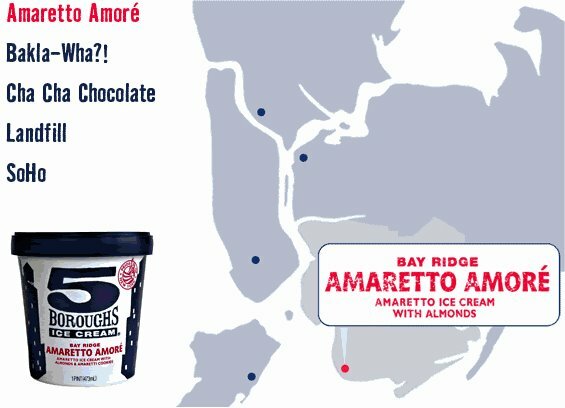 5 Boroughs Ice Cream is a local ice cream shop started in Astoria. They just re-debuted after a hiatus and currently have five flavors - one for each borough. There’s the Bay Ridge Amaretto Amoré, Astoria Bakla-Wha? !, which has actual baklava chunks in it, the South Bronx Cha Cha Chocolate with chipotle and cinnamon, SoHo cappuccino ice cream, and the Staten Island Land Fill, which has "everything but the kitchen sink - recycling everyone loves." This is definitely on Brooklyn Ramblings’ list of things to try. Oh yeah, and you can buy it at Sahadi's. We’re also eager for the Holy F’n Canolli and Potholes & Cream flavors to come back. Related link at 3 Bikini. My interest in maps of all kind and the visual depiction of data brought me to Lawrence Weschler's Everything That Rises: A Book of Convergences, and from there to McSweeney's, which is running a contest challenging readers to submit their own examples of convergences. 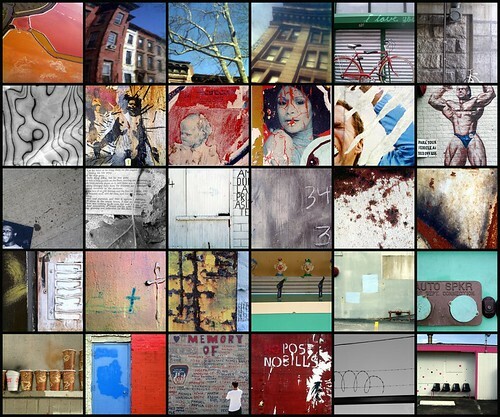 Weschler's convergences are images from vastly dissimilar areas that strike strange resonances when paired. One reviewer described the viewer's sense of frisson as "the pleasure of unlikely alignments and beguiling resonances." 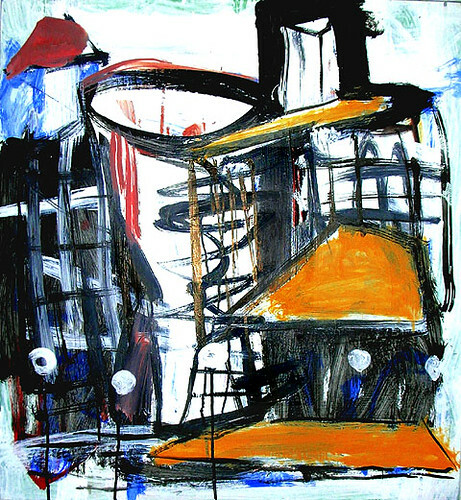 He continues: "Time (like mirrors, paintings, and the eye of the beholder) has its own capacity for creating sameness, for ignoring the different and competing politico-economic contexts of socialism and capitalism and finding between them the sublime commonality of a sailor slouching in Poland and a Santa Monica woman slumped in her cocktail dress." 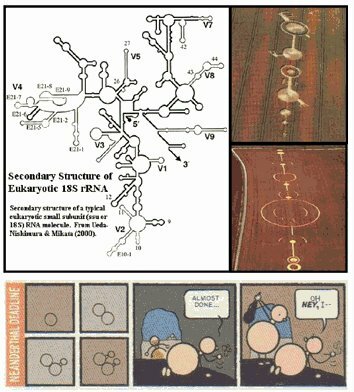 Clockwise from left: RNA strands, alien crop circles 1 & 2, cartoon by Chris Ware. "Robert M. Scarano Jr., an architect who has been active during Brooklyn’s construction boom, agreed this week to settle charges brought by the Buildings Department that he violated zoning rules or building codes in the design of more than two dozen apartment buildings. The city said that many of his buildings were larger than allowed by zoning, and it also charged that he failed to guarantee safe conditions at a construction site where a worker was killed in March. Mr. Scarano agreed to drop out of a program that allows architects to approve their own plans without regular review from the Buildings Department. His building designs will now have to be approved by city examiners. The settlement specified that it was not an admission of guilt or liability by Mr. Scarano." My question - does this mean that plans that he approved himself as recently as June will be grandfathered in, without city oversight? My post yesterday was the first time I’d heard of Scarano Architects, who are submitting plans to build on the corner of 4th Ave & 12th St. For those of you who are catching up along with me, here's the 411 on one of the biggest and most controversial developers in Brooklyn. Charges are currently pending against Scarano for his practice of counting mezzanine space as “storage areas,” allowing him to put up buildings that are larger than zoning allows, and out of proportion to the neighborhood. The city's Buildings Department has accused him of knowingly ignoring building codes and zoning rules. If he is found to have abused the honor system that allows architects and engineers to police themselves by approving their own building plans, he will lose the right to sign off on building plans without city review. Update: photos are representative examples of Scarano buildings, showing their modernist design and how noticably out of scale with the neighborhood they are. BK Ramblings hasn't been able to get our hands on the actual plans for the building at 4th Ave & 12th St.
Canoeing launches from Carroll Gardens, at the end of 2nd Street on the north side of the canal. They run a bunch of free public programs throughout the summer. This upcoming Saturday, there’s a Red Hook discovery tour and shoreline cleaning run in conjunction with Red Hook Boaters, from 9 am - 1 pm, launching from the Louis Valentino Jr. park pier. If you want to go whenever, on your own schedule, joining the canoe club allows you to take out a canoe whenever one is free. Brooklyn Ramblings has been a member now for about three years, and lemme tell you, there’s nothing like getting off work and being out on the water half an hour later. Urban canoeing at its best. The former beer distributor at the corner of 4th Avenue and 12th Street has been an empty lot since the fall of 2004. 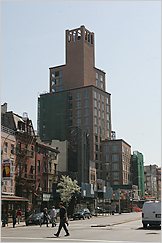 In December 2003, the building was bought by developer Park Slope Group, who planned to build a 6 story, 145,000 square foot building with 96 units of housing. Shortly before the winter of 2004, there was a flurry of activity for about a week as work crews installed plywood construction fencing and tore the building down. The demolition was halted on November 4, 2004 by ECB for failing to carry out a safe demolition. Since then, nada. The demolition permit expired in December of 2004. As recently as June 19, 2006, the date of the last DOB inspection, no new permit had been obtained. The hearing against MMG Design, the construction group, for this latest ECB violation is on August 7th at 10:30am in the Brooklyn DOB office. They were last cited $2,500 in May of 2005 for the identical problem, in addition to the November 2004 citation for $2,000 for failing to carry out a safe demolition. Both citations remains unpaid. Since November of 2004, the sidewalk has been about two feet wide, interrupted by two trees, forcing pedestrians out into the street. If you go by, you’ll see drunken looking fencing curving this way and that way, and a fair amount of trash and dog feces on the small amount of sidewalk that is still open. The inside of the lot is relatively clean, especially when you consider that it’s essentially been an abandoned lot for almost two years. Change may be on the way, however – it looks like the developer is trying to get moving on this again. On June 22nd, the city approved a building plan submitted by Michael Matrisciani of the Park Slope Group, working with Scarano Architects, who received the Project of the Year Award from the New York State Association for Affordable Housing, and who is also building the 12 story tower at 255 4th Avenue at Carroll. 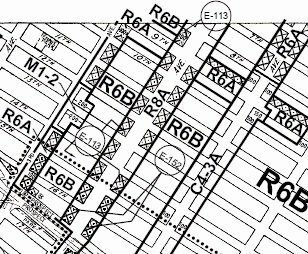 By zoning much of 4th Avenue as R8-A, the City says that it is trying to create incentives for the development and preservation of affordable housing. However, R8-A zoning requires that development be consistent with the character of the neighborhood. Opposition to the planned 12 story building on 4th Avenue and 12th Street comes from the Park Slope South Community Group, who are concerned about the pace of development in the neighborhood, and have posted signs reading “Kill the 12-story monster” nearby. To stay up to date on this, check out the Park Slope South Community Group’s website. Commuters through downtown Brooklyn's Cadman Plaza were treated to an unexpected sight last night - children feeding pigs, goats and chickens in front of Borough Hall. It was all part of the “National Night Out Against Crime," an annual NYPD program intended to build stronger police-community relations. Brooklyn borough president Marty Markowitz stopped by several of the "Night Out" events around Brooklyn, and was met by politicos including Mayor Bloomberg and Police Commissioner Ray Kelly at the 60th Precinct event at the New York Aquarium in Coney Island. 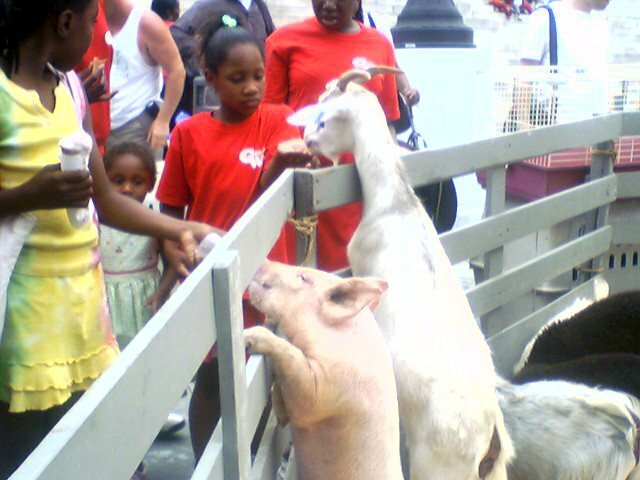 Brooklyn Ramblings didn't make it down to Coney Island, but from our vantage point in downtown Brooklyn, the petting zoo was a huge hit. In Sunset Park right off the Gowanus Expressway stands this beaut of an old factory. The view from 39th Street shows white walls, while the facade on the 38th Street side (perhaps due to the highway offramp) is black. A real life black & white cookie. Spurred by the latest NYPD “war on cyclists,” who seem to think that targeting bikers is the solution to all that ails New York, Aaron Naparstek over at Streetsblog has debuted a weekly feature called The Weekly Carnage. Every Friday morning we will tally up and present the previous week's motor vehicle mayhem throughout the region -- deaths, injuries and property destruction. It's a grim accounting but we feel like someone's got to do it. 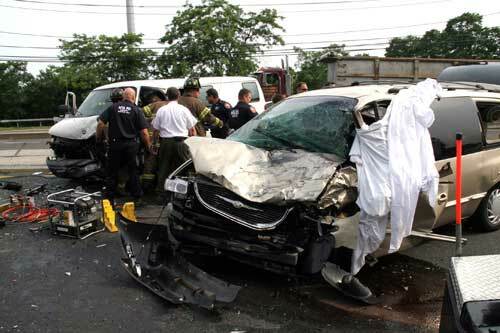 The first in the series links to 23 gory car crashes. It’s a good reminder that although bikers aren't always perfect citizens of the road (who is, really? ), cars pose the more serious danger on the streets. This early 1900s example of Art Deco industrial architecture is the Commodore Manufacturing Corporation, Criterion Bell & Specialty at 140 43rd Street on 2nd Avenue in Sunset Park. Commodore distributes Christmas ornaments, and there are a bunch of other small manufacturers in the building. This building is part of the Sunset Park waterfront district, which was a major maritime port from the turn of the century until the 1960s. Property Shark says this beauty was built in 1917. It has many similarities in style to the nearby Brooklyn Army Terminal, which was built the next year, in 1918. I learned from the Municipal Art Society that a number of Art Deco commercial buildings were built in downtown Brooklyn during the Depression, including the Woolworth Building on Fulton Mall, and what was at the time the Brooklyn office for the New York Times. I didn't realize that Art Deco got started that early, but I'm no architecture expert so what do I know. Check out the gorgeous details on the stone facade! I really like how the metal bannister echoes the carved stone walls. If you were to walk straight uphill from here, you'd hit Sunset Park, the neighborhood namesake and the highest point in Brooklyn. The park is a great place to watch the fireworks on the Fourth of July. The Straphangers’ Campaign yesterday released their annual subway report card. It measures how reliable subway service is, whether you can get a seat at rush hour, how clean the cars are and whether you can hear the conductor’s announcements. Somehow the 6, which Brooklyn Ramblings thinks is the pokiest local around, ended up on top overall. But enough about Manhattan-only trains. How did the Brooklyn trains do? The N and W tied for the worst subway line, due mostly to the long period of time between trains, lack of seat availability, not arriving on time, and not being able to hear conductor announcements. Can you believe that the W has ten-minute intervals between trains all day, even at rush hour? If you’re coming from Bushwick, the train will come when it’s supposed to. The J/Z line had the greatest regularity of service, arriving within two to four minutes of its scheduled interval 92% of the time. Good thing, because you won’t be able to hear the announcements - 78% of announcements on the J/Z line are inadequate. The most irregular line is the 2, which arrived on time only 79% of the time. The 2 and C tied for the cleanest line - way to go, eastern Brooklyn. Cars on the G line had the worst record for breakdowns, suffering breakdown delays more than four times as often as cars on the 5, the best rated line. But, if you ride the 5, don’t hold your breath for a seat - riders on the 5 have only a 31% chance of getting a seat at rush hour.